Despite beating street estimates on the back of market diversification, Qualcomm stock is down in aftermarket trading as shareholders await the resolution of external issues including an ongoing Apple licensing dispute, government probes and a hostile takeover by competitor Broadcom. For its first quarter of 2018, Qualcomm recorded revenue of $6.04 billion, far above the $5.93 billion expected by Wall Street, reports CNBC. Operating profit dropped 96 percent from the same time last year, however, as Apple continued to withhold royalty payments attributable to iPhone and iPad components. The two companies are embroiled in a contentious legal battle over royalty payments. Apple initiated with a nearly $1 billion lawsuit claiming Qualcomm abuses its "monopoly power" to charge customers excessive fees. Apple's suppliers followed suit and began withholding payments to Qualcomm last April. Qualcomm fired back with its own suit last year claiming breach of contract. The chipmaker continued to apply pressure by seeking to halt the sale of iOS devices in Germany and China. Most recently, Qualcomm leveraged owned Palm patents in a U.S. International Trade Commission complaint seeking the ban of U.S. iPhone 8 and iPhone X sales. Qualcomm was this quarter charged a $1.2 billion fine by the EU for illegal payments made to Apple in a bid to lock in LTE chip sales. The chipmaker also took a $6 billion charge related to recent U.S. tax reforms. Despite ongoing legal troubles, Qualcomm diversified by growing its chip business over the first quarter. Unit revenue hit $4.6 billion, up 13 percent year-over-year, with $955 million in earnings before tax, the report said. Looking ahead, Qualcomm signed a cross-licensing deal with Samsung, an agreement that will see Samsung withdraw interventions related to a South Korean probe over excessive licensing fees, reports Financial Times. 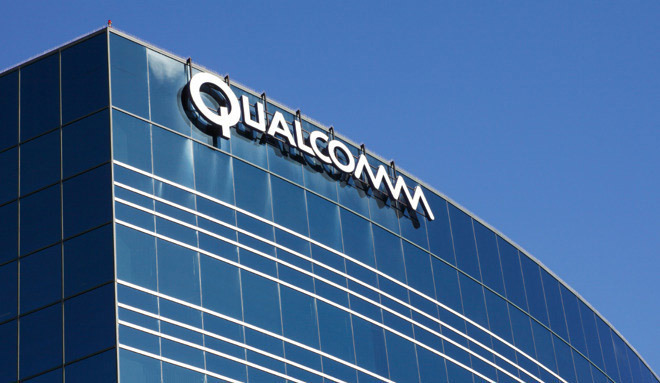 The two companies will be working on a "multiyear strategic relationship" for Qualcomm's chips that includes a transition to the 5G wireless protocol. The Samsung deal comes at an integral time for Qualcomm, which is fending off hostile takeover attempts from Broadcom. Qualcomm stock was down over one percent in after hours trading on Wednesday.